Sign of the Times And Wall Signs from a very snowy Smithers HQ,. As if January wasn’t bad enough, what with it being a never-ending type of month, we’ve since experienced the coldest February in five years and now March isn’t looking any better thanks to a certain grim beast from the east . Brilliant.Anyway, I digress …… it wouldn’t be British of me if I didn’t mention the weather though! Having woken up this morning and deciding to write a new blog, I then spent most of breakfast sat at our table wondering what on earth to write about. And it was whilst staring into the abyss, oblivious to the three conversations currently going on and all aimed in my direction, that it came to me ………. Wall Signs. Turns out the aforementioned abyss took the form of our “Do Not Enter” Wall Sign. Clarity at last – but I’m still none the wiser as to the conversations I missed.We have them everywhere at Smithers. Wall Signs that is. Everywhere. Bedroom. Bathroom. Storeroom. Even in the garden. We’re not hoarding freaks by any means, but we do like to see a room finished properly with appropriate accessories. Especially if those accessories carry a nice drop of humour and are verging on the side of insulting …….. maybe ‘appropriate’ is the wrong word?! Wall Signs seem to have become hugely popular, particularly within the last ten years, and if the Smithers demand is anything to go by, then the love of wall signage shows no signs of slowing down! No pun intended.We’ve showcased some great designs over the years – NO TRESSPASSING is still one of my favourites – it was followed up with VIOLATORS WILL BE SHOT, SURVIVORS WILL BE SHOT AGAIN. Adding wall décor to a space is the perfect to way to personalise the room and give it those all important finishing touches. Whilst my tastes might be slightly warped, you’ll be pleased to know not all our wall options are offensive. We’ve taken inspiration from the film industry, music, the theatre, fairgrounds and of course, industrial themes. We’ve also realised that people like their wall signage to resonate with themselves, so we try to offer designs that will appeal to the individual. This theory also explains my sentiments to people without even having to open my mouth. Perfection! 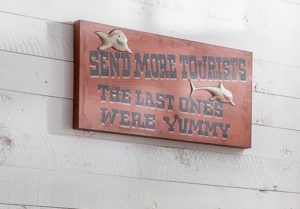 One of my current favourite wall signs is The Yummy Tourist. The colours are great, it’s a good size and brilliantly handpainted. They never fail to raise a smile from passers by and bring a lovely dollop of warm humour to any space. Signs that are also a lighting option have proved hughely popular with us from the off. We love nothing more than a double sided coin, and it would appear you do to so of course we were happy to oblige and add some more lightbulb designs to the collection. Whilst the David Bowie inspired Lightning Bolt is always a winner, its two other Light Wall Signs that are my preference. The Neon Lip Wall Light from Seletti is a retro dream come true. 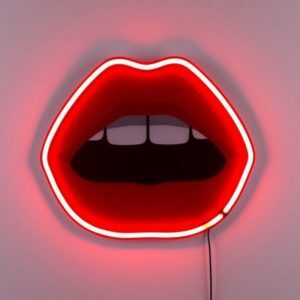 Perfectly pouting lips are encased in neon lighting and are the absolute epitome of pop art fun. The Lips transform a space like no other and never seem to get bad press from anyone. No mean feat. Now being something a party boy in the 80’s, this was always going to prove popular with myself. For those of you born after this era, you may want to revert to google. And for the rest of us normal people, my apologies for the fact that you are now going to singing this on repeat! 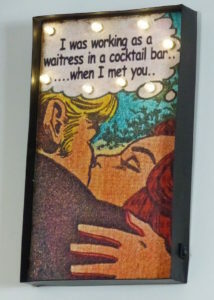 Our Cocktail Bar Sign pays homage to the iconic lyrics of Human League’s 1981 ‘Don’t You Want Me’ hit. To be fair, it doesn’t seem to matter what age you are when it comes to this Wall Lightbulb Sign and has proved popular with all manner of folk. The cartoon artwork is the perfect finish to this super cool sign. Don’t take my word for it though – I’m only a man which renders my opinion regularly irrelevant at Smithers HQ. I jest of course, as if I would ever not have the last word! Anyway, take a look for yourself. Theres some stonking designs and we’re continuously adding to the collection so all good. Right, I’m off to the barn to stock up the log piles, as despite my greatest efforts, I’ve yet to convince any other member of the Smithers Team that this is part of their job description. Wish me luck.